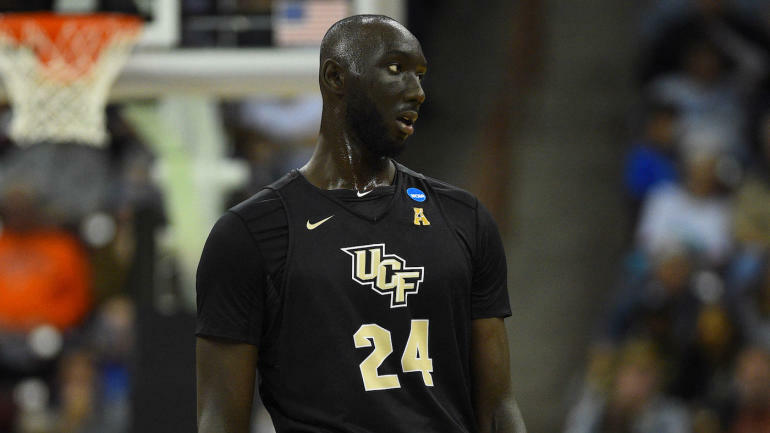 Duke freshman Zion Williamson has made a habit this season of providing flashy dunks and the occasional posterization of defenders in the process, but UCF center Tacko Fall is not concerned about that potential when the two meet on Sunday in the second round of the NCAA Tournament. And why should he be? Fall is a gigantic 7-foot-6 rim protector, the tallest player in this year's NCAA Tournament field. He averages 2.6 swats per game this season, which ranks second among all players in the field. People simply don't dunk on him. So not only is he unconcerned about Zion jamming on him, he's confident it won't be happening. "It's very hard [to dunk on me]," Fall duty NCAA.com on Friday. "I won't allow it. I won't allow it. I won't allow him to put on any of his highlight tapes.
" He's someone, pretty much, we've never seen in weight , size. He's immense, and he's so quick, "he said of Williamson, who is 6-7 and weighs 284 pounds." But coaches are going to have a great game plan, especially Coach [Johnny] Dawkins, I feel like, because he played for Duke, so he's going to have to help us out. " " What was supposed to say? "Williamson initially asked, while teammate RJ Barrett rolled his eyes at the media's efforts to generate prize fight-like hype for Sunday's game.
" He is a very unique player, and I got a lot or respect for him because to him that size and be able to move the way he does and have as much skill as he does, he's a great player, "Williamson said." I think we're just going to have to come together with a team and figure out what we're going to do to stop him. " People will surely be tuned in to watch what happens, but come for the dunk drama and stay for what the matchup presents in the two most unique player's still in the field. Zion, of course, is his own one-man show – he dunked and dashed his Duke team to a blowout win in the first round – but his own quirky and weird specimen too. When the two meet on the court to battle for a spot in the Sweet 16, all eyes will be on how that specific matchup in the post unfolds.